The name Latvia comes from ancient Latgallians, one of four Indo European Baltic tribes that inhabited the area. All four tribes formed the ethnic Latvians of today. Latvia lies on the Baltic Sea in northern Europe, and is one of three Baltic States (to include Estonia and Lithuania.) Her neighbors are Estonia to the north, Lithuania to the south, Russia to the east, and Belarus to the southeast. The capital and largest city is Riga, which lies on the gulf, at the mouth of the Duagava River. Riga has been an important maritime trading locale for centuries. Established in 1201, much of Riga’s historical center is an UNESCO World Heritage site. Its buildings are the world’s best display of Jugendstil or Art Noveau. Intricate floral designs, ornate figures and elaborate forms still decorate the facades of buildings all over Riga. Latvia has a long and difficult past. In 1561, German was the official language of the region, after being forced to be part of the state of Livonia back in the 13th century. Poland then conquered the territory in 1562, until the Swedes took over, from 1629 until 1721. It was then the Russians who moved in to rule the land, from 1721 until 1918. Despite being ruled by the Russians for such a long time, Latvians managed to preserve their language, customs and folklore. It was the Russian Revolution that gave them an opportunity for freedom, although only briefly. Latvia gained independence for just over 20 years, in 1918. During World War II, German armies occupied the land from 1941 to 1944. It was a tragic time when 95% of the 70,000 Jews living there, were massacred. Russia regained control after that war and kept it until the breakup of the Soviet Union. Independence was restored on August 21, 1991. Latvia has since joined NATO and the European Union as of 2004. There was a remarkable event that occurred on August 23, 1989 between all three countries in the Baltic States. It was a day that holding hands changed the world and is known as “The Baltic Way.” More than a million people held hands to form a human chain over 400 miles long, linking all three capitals from Estonia to Latvia and Lithuania. It was a peaceful political demonstration for freedom, protesting the secret signing of the Hitler-Stalin pact in 1939, known as the Molotov-Ribbentrop Pact. It wasn’t long after this amazing show of solidarity, through peace protest, that all three states gained independence. Latvia is also known as, “The Land that Sings.” The “Song and Dance Celebration” is the biggest and best performance in all of Latvia. The first one occurred in 1873 and is recognized by UNESCO as being a unique, traditional expression. The celebration is held only once every five years and there have been 25 of them to date. The next one will happen in 2018. Choirs and dancers join together, as many as 20,000 on one stage, to perform with precision and grace. 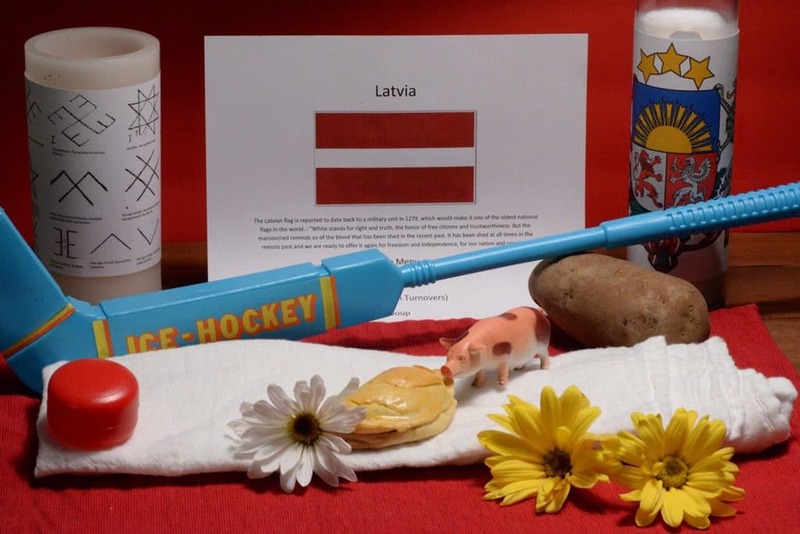 These celebrations were held as part of non-violent resistance throughout difficult times in Latvia’s history and remain an integral part of Latvian culture. They have one of the largest collections of traditional folk songs in the world, numbering over 300,000. Another popular celebration occurs each year around the summer solstice. The festival is called Jani. It is a day when everyone shows a bit of their pagan side. Originally, it was a fertility festival that was celebrated after the crops were sown, but before harvest. Today nearly everyone heads to the countryside for the Jani celebrations. Bonfires are lit and then they make hundreds of bouquets and wreaths out of herbs and flowers. The men’s wreaths are often made of oak leaves, a symbol of Latvia, while the women’s are adorned with flowers. Even the livestock fences get a bit of the décor, as do the doors and gates of most homes. A special cheese, made with caraway seeds, is a Jani tradition and found on every table along with meat patties and beer. Of course singing and dancing is part of the celebration as well. There is another tradition at Jani for the romantics, where they go into the forest to find the “flower of the fern.” Evidently there are no flowers to be found on ferns, so it is just a way to lure young lovers to the test, sort of like going to watch submarine races in the USA. Latvians celebrate the winter solstice as well. The people of Latvia are well educated and hard-working; most speak three different languages, which is well above the global standard. Latvian is the official language but other popular foreign languages are Russian, English, German, French and various Nordic languages. They are also known to be polite and tolerant. The Latvian people have peacefully coexisted with at least 150 other ethnic minority groups. Freedom of belief is another component of Latvian life. They are the second most secular nation in Europe, after their neighbors in Estonia. The largest religious groups in the country are Lutheran, Roman Catholic and Russian Orthodox. They are also known for equal opportunities. Latvian women have had the right to vote since 1920, and have held top political posts. Today Latvia has the highest proportion of female top executives in Europe and they rank second in the world. Speaking of second, that is how they rank in the Environmental Performance Index. About half of Latvia is covered by forest and it is one of the most environmentally friendly countries on the planet. The country is home to over 12,500 rivers and 2256 lakes. Latvia also has the widest waterfall in all of Europe, called Ventas Rumba. It is a stunning 360 meters wide yet only two meters tall. Latvia is a gem for nature lovers, where wildlife, flora and fauna abound. It is home to the European lynx, wolves and the incredibly rare, black stork. Foraging for berries and mushrooms is a favorite pastime. Latvia has been one of the fastest growing economies in Europe. It did suffer greatly during the global financial crisis of ‘08 but has since recovered following harsh austerity programs. It operates on free-market principles. Their primary industries are agriculture, seafaring, fishing and forestry. As we look into the cuisine of Latvia, it features quite a bit of pork. In fact some say you can’t avoid it. Even when ordering vegetables, they are likely cooked in a bit of pork fat. Meat is often featured in main meals. Fish is also regularly consumed, due to the location on the Baltic Sea. Common cooking ingredients are found locally like: potatoes, beets, wheat, barley, cabbage, onions and pork. Latvians do not use a lot of spices in their cooking; simply, black pepper, dill and caraway seeds. A dish of grey peas, with onions and bacon, is considered the national dish. Rupjmainze is dark bread made from rye and is considered a national staple. Another loved dish is called Sklandrausis. It is a sweet pie made of rye dough and filled with mashed potatoes and carrots, then seasoned with caraway seeds. 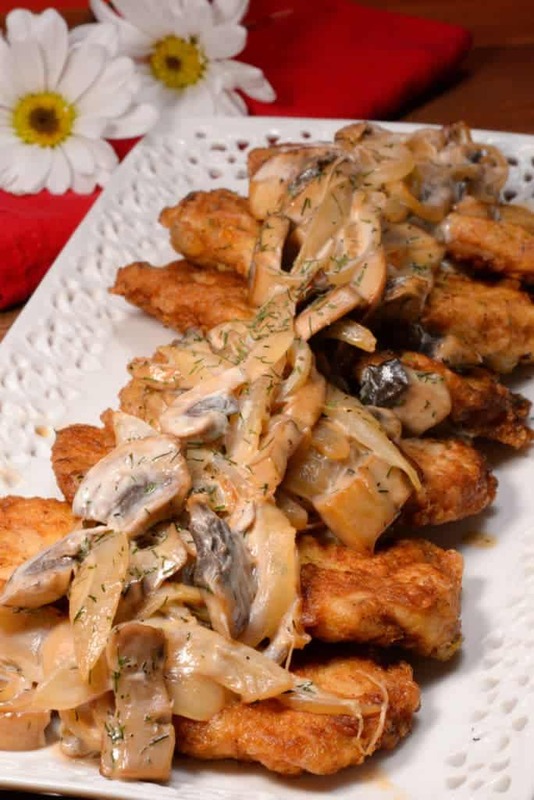 Soups, stews and dairy also play important roles in Latvian cuisine. We began with a toast, “Prieka!” which means “Cheers.” They have a liquor in Latvia called Black Balsam and it is not for the faint of heart. It is usually not taken straight but rather mixed with teas and various other mixers. It is said to cure just about anything that ails you. To begin our meal, we left our napkin on the table, as it is customary there to simply use it to wipe your mouth and then return it to the table. We also ate our meal continental style; fork in left hand knife in the right. 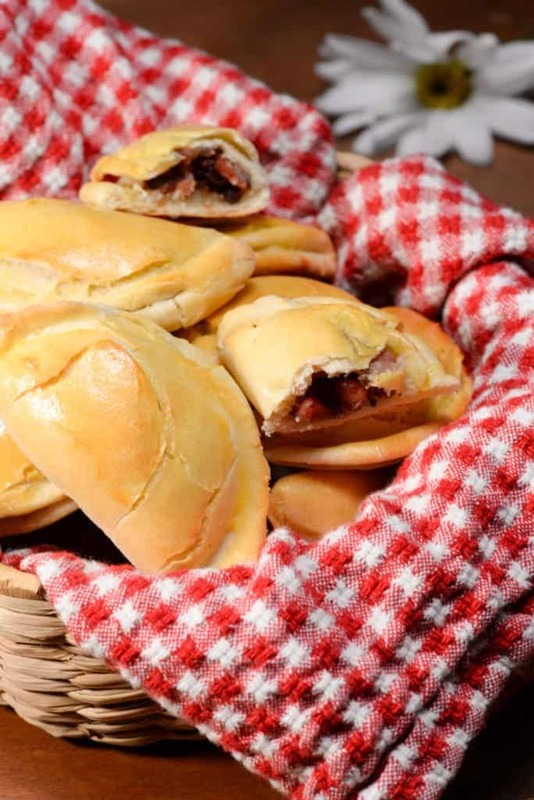 Our first course was the ubiquitous piragi; a turnover that is stuffed with bacon and onions. A delightful little treat, after all, it is pretty hard to go wrong with bacon. Next was a delicious and beautifully colored, cold, beet soup. 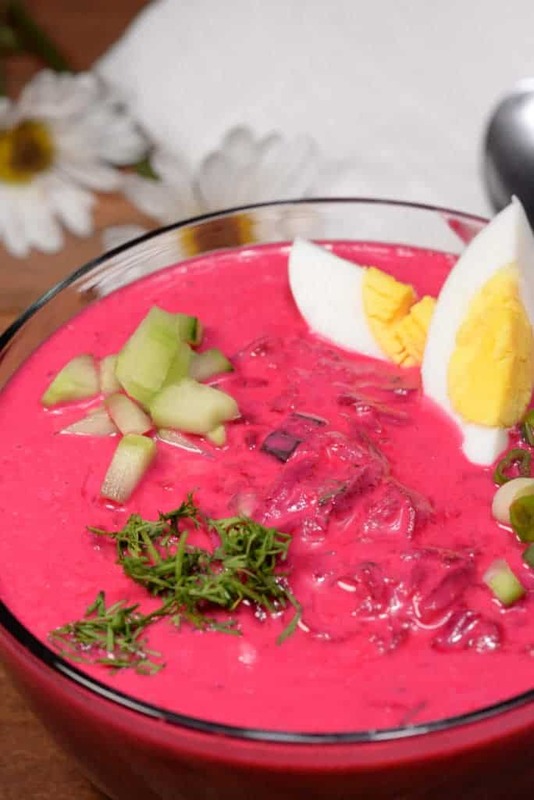 The beets are cooked until tender and then grated and mixed with kefir or buttermilk. It also had cucumber, dill and was topped with hard-boiled eggs. The beets, of course, color the soup a bright pink. This is would be a refreshing soup to enjoy on a hot summer day (to “beet” the heat). The main course was a pork cutlet covered with a mushroom cream sauce. I cook a similar dish, that I have always considered a comfort food, made with a can of cream of mushroom soup. I wonder now why I never made it from scratch. I certainly will from now on. What a delicious main dish. 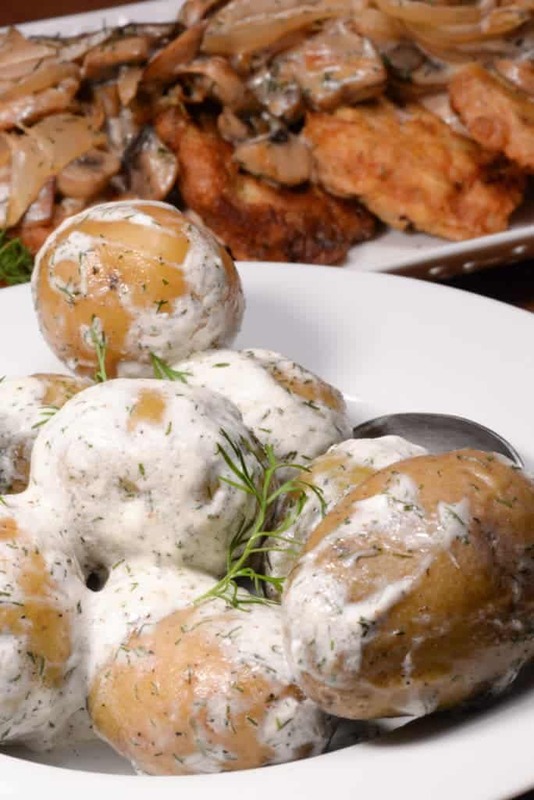 It was easy to make and had an exceptional flavor with the caramelized onions and mushrooms in a bit of cream and topped with dill. Awesome! On the side, the pork was served with boiled potatoes that were smothered in butter and sour cream and sprinkled with copious amounts of dill. Very enjoyable. For dessert we delighted on a light and flavorful cranberry mousse. 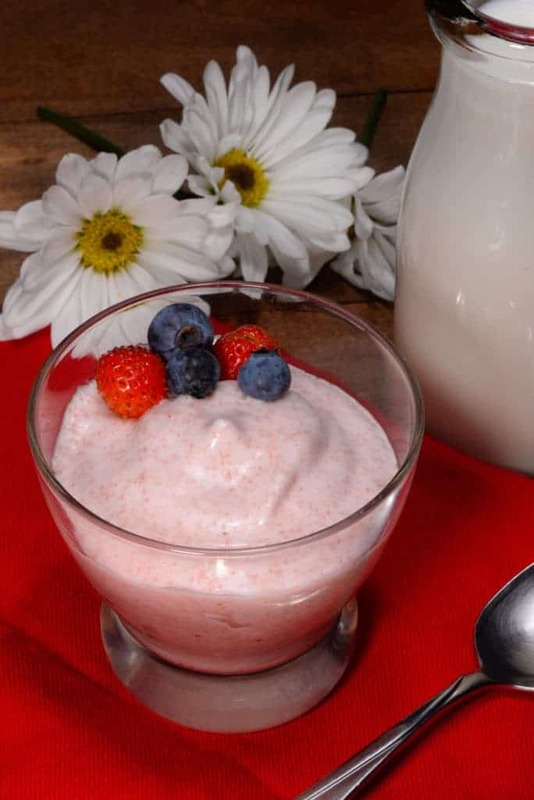 The mousse is made by whipping up farina, or cream of wheat. It was topped with a few other berries and served with milk. It would make a lovely breakfast item as well. As we say goodbye to Latvia, we do so by singing a song from their homeland, which would be commonplace to do after a Latvian meal. Where the Latvian daughters bloom. Where the Latvian sons sing. Let us dance in happiness there.